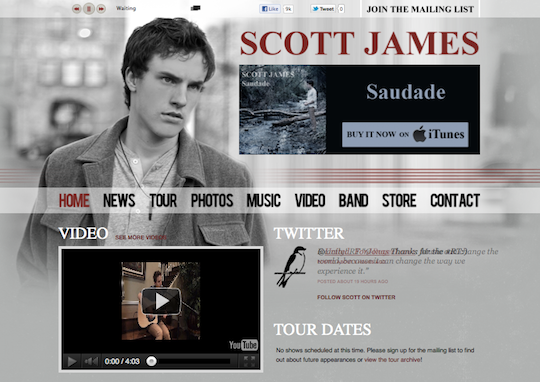 We just did a re-design of Scott James’ web presence as he embarks on the next chapter of his growing career. Check out the new ScottJamesMusic.com! We are proud to announce the launch of an awesome website for the very talented (and only 15 years old!) Scott James! Check it out here. We implemented Topspin for Scott’s mailing list collection and e-commerce, Soundcloud for Scott’s audio content, YouTube for Scott’s video content and Facebook to feed Scott’s photos.